Jerry Horne returns to town and he and Ben celebrate with a trip to One Eyed Jack's. We also meet Albert Rosenfield and his team. Agent Cooper has an interesting dream. Speaking of dreams, Agent Cooper tries to identify the identify of the "J" mentioned in Laura Palmer's last diary entry by throwing rocks at a bottle, a technique revealed to him in a previous dream about Tibet. Mike and Bobby have a run in with a gun toting Leo Johnson. And, of course, Nadine finally perfects her silent drape runner. After this episode, Kid said, "This show is so weird. I have got to make my friends watch it." High praise from a 15 year old. 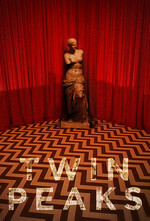 As always, I asked who do you think Laura Palmer? "Well, that Bob guy, of course, but maybe Leo Johnson." I'm watching it on a better TV this go, so I finally noticed that Agent Cooper is meant to be older when in the Red Room. That was really horrible makeup. I did a better job using a contour kit to age Kid for a GISHWHES item last year. But otherwise, I think that dream sequence is the show hitting its stride. To me, I think that's when it went from quirky to weird (in a good way!). I think the red room scene might be a harbinger for what is appearing to be absolutely unprofessional investigative practices on the part of Agent Cooper. He sees the town is hurting and increasingly conflicted about The Story Of Laura, so let's see what happens if we tie 4 flowers to a telephone pole. There's a certain kinship between Dale Cooper and the Mayor of Portlandia. Meanwhile, Dickface Rosenfield comes up with the science. Leo, man. I'm waiting for a Dexter crossover episode for that guy. Also, a pretty extreme character for 1990, I want to say (I wasn't watching a lot of TV when this was on). I don't know how long it's been since I've had such a visceral sense of menace from any character on a screen. One of the unexpected effects of watching this now is the problem of having watched a lot of "Seinfeld" in the meantime. It's gonna take a few more episodes before Grace Zabriskie and Warren Frost aren't dissonant for me, though James, or as I think of him, "the guy from 'A Few Good Men'," has been easier to assimilate. So many character moments in this episode. We see just how terrible Ed and Nadine's home life is, we see the Horne brothers wallowing in vice, we see Leo and Bobby negotiate a drug deal gone south in a frankly terrifying scene in the woods at midnight, we see Agent Cooper's unorthodox investigatory techniques in action, we see Audrey dance, we see the Palmers continue to crumble, and we see what is surely the strangest sequence ever shown on television at that time. All of these images stay with me. Thinking back on this episode now, though, the image I think about the most is Audrey dancing. She's dissociating. She idealizes Agent Cooper and tries to get to know him through his surface likes and dislikes. But when she thinks about the still-nebulous relationship Laura had with her father, she shuts out everything—even Coop—and ignores the rest of the world as she dances dreamily. She knows her dad is dirty—just how much does she know? We've already seen so many of Benjamin Horne's terrible secrets—how dirty is he? Certainly he's dirty enough to drive the thought of Audrey's white-knight crush completely out of her mind. Certainly he threw something about Laura in Audrey's face to hurt her in the previous episode. She knows her dad is dirty—just how much does she know? That might be the best funeral scene I've seen. It's not planned for laughs, and in fact starts sincere, gets angry and then distraught, but being distraught on top of a coffin while riding it up and down, up and down, is well, hilarious. No less sad, but really funny.